A number of transcription factors coordinate differentiation by simultaneously regulating gene expression and cell proliferation. CCAAT/enhancer binding protein alpha (C/EBPα) is a basic/leucine zipper transcription factor that integrates transcription with proliferation to regulate the differentiation of tissues involved in energy balance. In the pituitary, C/EBPα regulates the transcription of a key metabolic regulator, growth hormone. We examined the consequences of C/EBPα expression on proliferation of the transformed, mouse GHFT1-5 pituitary progenitor cell line. In contrast to mature pituitary cells, GHFT1-5 cells do not contain C/EBPα. Ectopic expression of C/EBPα in the progenitor cells resulted in prolongation of both growth 1 (G1) and the DNA synthesis (S) phases of the cell cycle. Transcription activation domain 1 and 2 of C/EBPα were required for prolongation of G1, but not of S. Some transcriptionally inactive derivatives of C/EBPα remained competent for G1 and S phase prolongation. C/EBPα deleted of its leucine zipper dimerization functions was as effective as full-length C/EBPα in prolonging G1 and S.
We found that C/EBPα utilizes mechanistically distinct activities to prolong the cell cycle in G1 and S in pituitary progenitor cells. G1 and S phase prolongation did not require that C/EBPα remained transcriptionally active or retained the ability to dimerize via the leucine zipper. G1, but not S, arrest required a domain overlapping with C/EBPα transcription activation functions 1 and 2. Separation of mechanisms governing proliferation and transcription permits C/EBPα to regulate gene expression independently of its effects on proliferation. Differentiation is commonly associated with intermingled changes in gene expression and cellular proliferation. In some differentiating cell types, changes in both gene transcription and proliferation are regulated by the same transcription factor [1–9]. CCAAT/Enhancer Binding Protein alpha (C/EBPα) is a transcription factor that is required for the differentiation of a number of tissues [10–18]. Mice homozygous for C/EBPα null alleles have severe defects in tissues involved in metabolic homeostasis [19–21]. Cellular proliferation is elevated in the liver of these knockout mice  suggesting that C/EBPα blocks proliferation in vivo. In cultured cells, C/EBPα expression leads to decreased colony formation upon antibiotic selection [23–25], decreased DNA synthesis [22, 24–27] and an enhanced proportion of cells in the G1 phase of the cell cycle . Thus, C/EBPα regulates cellular proliferation, as well as gene transcription. C/EBPα contains a bZIP domain conserved at the carboxy terminus of a number of transcription factors [12, 28]. The bZIP domain consists of a basic region that binds directly to DNA, followed immediately by a leucine zipper. C/EBPα dimerizes via the leucine zipper. This dimerization is required for DNA binding [28, 29]. At least three transcription activation functions have been described in the more amino terminal regions of C/EBPα [30–32]. C/EBPα domains and activities associated with proliferation arrest also have been identified, but vary considerably between studies [23, 25, 33–36]. C/EBPα binds to and activates transcription of the gene promoter for the p21 inhibitor of cyclin-dependent kinase (CDK) . This led to speculation that p21 gene activation may contribute to cell cycle arrest by C/EBPα . Similarly, suppression of mitotic growth during adipocyte differentiation was associated with C/EBPα activation of the promoters of gadd45 (growth arrest and DNA damage-inducible gene 45), gas2 and gas3 (growth arrest-associated genes 2 and 3) [5, 6, 38, 39]. However, C/EBPα mutants defective in DNA binding still blocked proliferation [25, 33]. This suggested that direct promoter activation was unnecessary, or redundant, for C/EBPα proliferation arrest . Possible mechanisms of transcription-independent proliferation arrest by C/EBPα have been suggested by a number of studies. Decreased proliferation was associated with C/EBPα stabilization of the p21 protein [22, 24]. p21 interacted directly with a large internal segment of C/EBPα that included transcription activation domain 3  (see Fig. 1A). CDK2 and CDK4 also interacted with segments of C/EBPα close to, and within, transcription activation domain 3 . CDK2 also interacted with the basic region of the C/EBPα . p21 also has a second interaction site, within the leucine zipper of C/EBPα . in vitro, C/EBPα enhanced p21 inhibition of CDK2 activity. C/EBPα inhibition of CDK2 activity correlated with p21 binding to C/EBPα transcription activation domain 3 . However, proliferation arrest by C/EBPα still occurred in cell lines not containing p21 genes . This indicated that proliferation arrest by C/EBPα did not rely solely upon C/EBPα enhancement of CDK inhibition by p21. A, Positions of the transcription activation (TA), DNA binding (basic) and dimerization (ZIP) domains along the linear sequence of C/EBPα. The numbers below the C/EBPα diagram indicate the amino acid positions at the boundaries of the domains. Also shown are C/EBPα sequences involved in known actions with the indicated cell-cycle proteins: p107 , p21 , CDK2 [25, 36], CDK4  and E2F . B, Schematic of the GFP fusions with full-length and mutant C/EBPα used in the studies reported here. Another mechanism reported for proliferation blockage by C/EBPα involves the E2F-DP1 transcription complexes. E2F complexes activate genes required for entry into S phase. C/EBPα binds to and inhibits transcriptional activation by E2F [26, 33]. The complex of E2F with the retinoblastoma-related p107 protein is prevalent in cycling cells. Transcription activation domain 2 of C/EBPα was observed to interact specifically with p107 to disrupt p107/E2F complex formation [34, 35]. Disruption of E2F activity also was associated the basic domain of C/EBPα [33, 34]. Thus, a variety of interactions and mechanisms are potentially involved in proliferation arrest by C/EBPα. This variability may indicate divergent mechanisms for the block of proliferation by C/EBPα in different study conditions and/or cell types. In pituitary cells, C/EBPα is part of a multi-subunit complex [41, 42] that activates the growth hormone  and prolactin [43, 44] promoters. Full-length C/EBPα is absent from the pituitary progenitor GHFT1-5 cell line [42, 45] in which ectopically expressed C/EBPα activates co-transfected growth hormone and prolactin promoters [42, 44, 45]. We show here that ectopically expressed C/EBPα prolongs GHFT1-5 cells in the G1 and S phases of the cell cycle in a transcription-independent fashion. Different C/EBPα domains were required for G1- and S-phase arrest. C/EBPα domains previously described for the interaction with p21 were not required for arrest in GHFT1-5 cells. 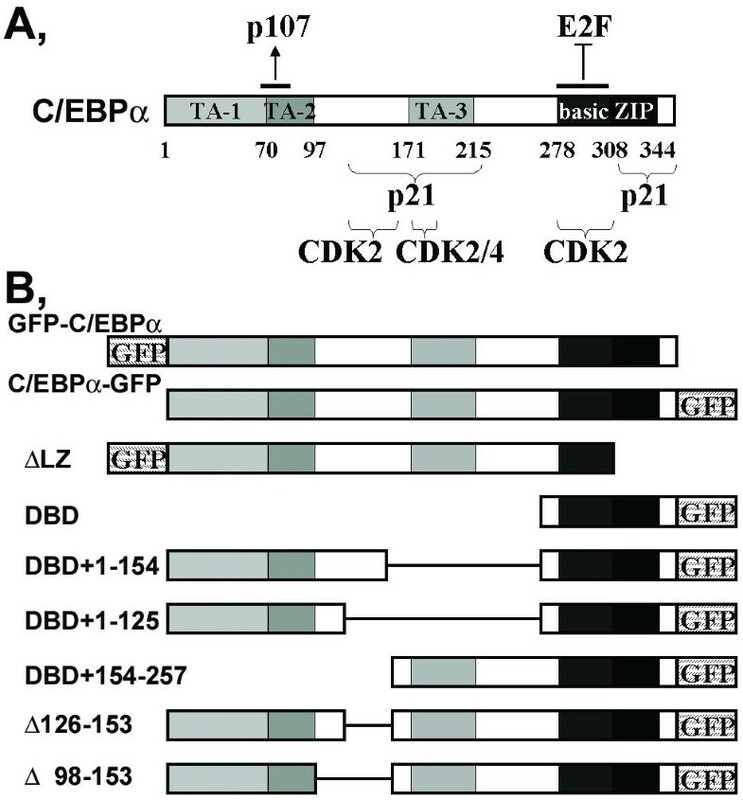 Rather, domains previously implicated in the regulation of the E2F and CDK2 pathways by C/EBPα were required for arrest of these progenitor cells. The domains of C/EBPα and their known interactions with cell-cycle proteins are summarized in figure 1A. We conducted studies to determine which, if any, of those activities affect the proliferation of GHFT1-5 pituitary progenitor cells. In prior studies, we noticed that fewer cells were present in GHFT1-5 cell cultures transfected with the C/EBPα expression vector than in cultures transfected with control vectors (X. Wang, F. S., unpublished data). The decreased cell number might be due to impaired proliferation of GHFT1-5 cells expressing C/EBPα. To examine if C/EBPα affected the progression of GHFT1-5 cells through the cell cycle, we needed to distinguish transfected cells that expressed C/EBPα from those that did not. We fused the cDNA for the green fluorescence protein (GFP) to either the 5' (GFP-C/EBPα) or the 3' (C/EBPα-GFP) end of the coding sequence of the C/EBPα cDNA. The cDNAs for the GFP-C/EBPα and C/EBPα-GFP fusion proteins were inserted into an expression vector and transfected into GHFT1-5 cells. Flow cytometry was used to specifically identify green fluorescent, C/EBPα-expressing cells. We initially characterized the abilities of the C/EBPα-GFP and GFP-C/EBPα fusion proteins to bind DNA and activate transcription in GHFT1-5 cells (Fig. 2). The C/EBPα-GFP or GFP-C/EBPα expression vectors were transfected into GHFT1-5 cells with a promoter consisting of a single C/EBPα binding site upstream of the growth hormone TATA box. This minimal promoter was specifically responsive to C/EBPα expression in GHFT1-5 cells [45, 46]. Cells transfected with the C/EBPα-GFP expression vector showed a statistically significant (p<0.05, n = 5) 9.66 +/- 6.08-fold higher promoter activity than did cells sham-transfected with the same expression vector deleted of the C/EBPα cDNA (Fig. 2A). In contrast, activation by GFP-C/EBPα was a statistically insignificant 1.88 +/- 1.48-fold (Fig. 2A). Promoter activation by C/EBPα-GFP was reproducibly less than promoter activation by unfused C/EBPα. Western blots of nuclear extracts from the transfected cells showed that unfused C/EBPα was expressed at marginally higher levels (Fig. 2B). A, Chloramphenicol acetyltransferase activity expressed from a promoter transiently transfected into GHFT1-5 cells together with vectors expressing C/EBPα, fused or not, with GFP. The promoter contained a single C/EBPα binding site upstream of a TATA box . CAT activities were normalized to the activity present in cells transfected with the expression vector not containing the C/EBPα cDNA ("Sham") and plotted as the mean +/- standard deviation from five independent experiments. 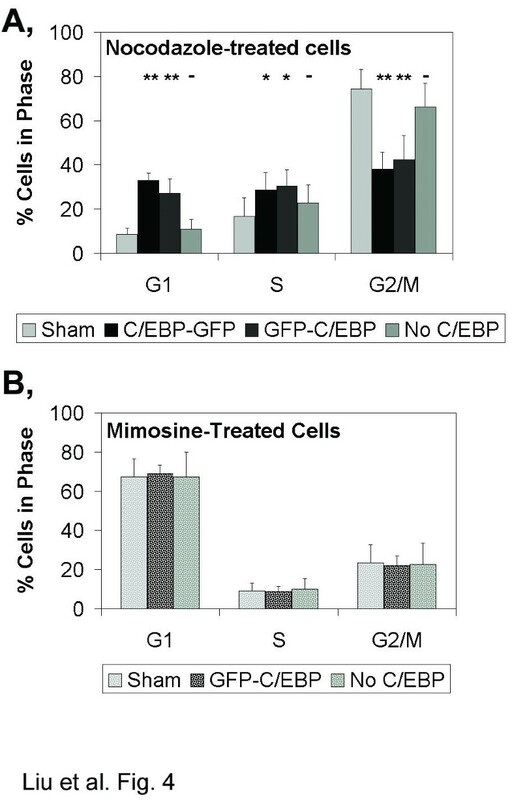 B, Nuclear extracts from sham-transfected cells and cells expressing C/EBPα, C/EBPα-GFP and GFP-C/EBPα were separated by SDS-polyacrylamide gel electrophoresis. The separated proteins were transferred to a membrane and stained with an antibody directed against the FLAG epitope, which was appended to the amino terminus of C/EBPα in all the constructs. Arrow, expressed C/EBPα-GFP and GFP-C/EBPα. C, Whole cell extracts, from cells transfected with C/EBPα-GFP and GFP-C/EBPα or GFP-C/EBPαΔLZ expression vectors, were incubated with a radiolabeled oligonucleotide containing a high affinity consensus C/EBPα binding site. The observed complexes were competed with a 1, 10 and 100 fold molar excess of unlabeled oligonucleotide or were supershifted with an antibody directed against C/EBPα. C/EBPα-GFP and GFP-C/EBPα both were expressed as intact, full-length proteins of the appropriate molecular weight (Fig. 2B, arrow). In addition, both C/EBPα-GFP and GFP-C/EBPα bound similarly to DNA (Fig. 2C). Extracts of cells expressing either C/EBPα-GFP or GFP-C/EBPα shifted the electrophoretic mobility of a radiolabeled oligonucleotide containing a C/EBPα binding site (Fig. 2C). No shift was observed with sham-transfected cells (not shown). The shifted bands were specifically competed by a 100-fold molar excess of the cold oligonucleotide and were supershifted with an antibody directed against C/EBPα. GFP-C/EBPα truncated of its leucine zipper (Fig. 1B) was ineffective at shifting the binding site (Fig. 2C, ΔLZ). Flow cytometry (discussed later) showed that comparable levels of green fluorescence were emitted from cells expressing C/EBPα-GFP, GFP-C/EBPα and ΔLZ. Thus, C/EBPα-GFP and GFP-C/EBPα were expressed and could bind to C/EBPα binding sites in DNA, but differed in their ability to activate gene transcription. Transcriptionally active C/EBPα-GFP and transcriptionally inactive GFP-C/EBPα were compared for their effects on proliferation of GHFT1-5 cells. We first determined the distribution of untransfected GHFT1-5 cells in each phase of the cell cycle. GHFT1-5 cells were grown to subconfluence, collected and the DNA within the cells was stained with propidium iodide. The DNA content within each cell was quantified by flow cytometry as the amount of orange fluorescence from the propidium iodide-stained DNA (see Materials and Methods for details). The fluorescence intensity measured from each cell falls into one of three populations: cells centered around the lowest level of orange fluorescence, cells centered around the highest level of orange fluorescence which is twice that of the lowest, and cells with intermediate levels of orange fluorescence. This corresponds, respectively, to cells containing a 2n DNA complement prior to duplication of the genome (in G1 phase), cells containing a 4n DNA complement following genome duplication (in growth phase 2 or in mitosis, G2/M), and cells containing a partially replicated genome intermediate between 2n and 4n (in S phase). As averaged from nine independent experiments, the proportion of growing GHFT1-5 cells in G1, S and G2/M corresponded to 42%, 38% and 20%, respectively (Fig 3, white bars). GHFT1-5 cells were grown to subconfluence and treated for 20 hours with DMSO (white bars), 100 ng/ml nocodazole (gray bars) or 0.5 mM mimosine (speckled gray bars), both in DMSO. The amount of DNA within each cell was measured by flow cytometric quantification of the orange fluorescence emitted from propidium iodide-stained DNA. The proportion of GHFT1-5 cells containing a 2n complement of DNA (G1), a 4n complement of DNA (G2/M), and an intermediate amount of DNA (S) was determined for each treatment and presented as the mean +/- standard deviation from nine independent experiments. We next synchronized GHFT1-5 cells in particular stages of the cell cycle. GHFT1-5 cells were treated for 20 hours with nocodazole, which prevents microtubule polymerization/depolymerization and exit from M phase . The delivery vehicle, DMSO, was added to parallel cell cultures. Cells also were treated with mimosine (in DMSO), which blocks cells in late G1 immediately before entry into S phase . Mimosine also prolongs some cell types in the S phase itself . GHFT1-5 cells grow with an average doubling time of approximately 18 to 24 hours. 20 hours of treatment allowed most cells to pass through one cell cycle and to accumulate as 4n cells upon nocodazole treatment (Fig. 3, light gray bars) or as 2n cells at the G1/S boundary upon mimosine treatment (Fig. 3, stippled gray bars). Thus, GHFT1-5 cells can be synchronized at particular stages of the cell cycle. Synchronization facilitated characterization of the cell cycle stages blocked or prolonged by C/EBPα expression. We determined if either C/EBPα-GFP or GFP-C/EBPα altered the distribution of GHFT1-5 cells in the G1, S or G2/M phases of the cell cycle. GHFT1-5 cells were transfected with the expression vectors for C/EBPα-GFP or GFP-C/EBPα, or with the sham expression vector not containing the C/EBPα cDNA. The cells were incubated for one day to allow time for C/EBPα expression. 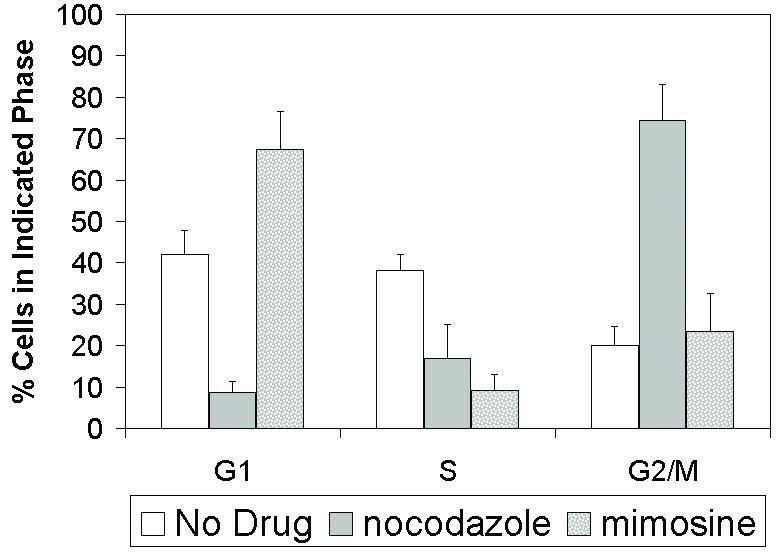 Cells were then synchronized in M-phase or in G1/S by 20-hour incubations with nocodazole (Fig. 4A) or mimosine (Fig. 4B). Cells were collected and stained with propidium iodide. Flow cytometry was used to measure DNA content in 1) cells transfected with the sham expression vector (Fig. 4, Sham), 2) green fluorescent cells expressing GFP-tagged C/EBPα (Fig. 4, C/EBPα-GFP or GFP-C/EBPα) or 3) the subpopulation of cells from the C/EBPα-GFP or GFP-C/EBPα transfections that did not express measurable amounts of green fluorescent C/EBPα (Fig. 4, No C/EBP). The "No C/EBP" cells represent an internal control for cells not expressing C/EBPα collected simultaneously with cells expressing C/EBPα. The No C/EBP controls also indicated the extent to which green fluorescent, C/EBPα-expressing cells were distinguished from non-expressing cells by flow cytometry. For all our experiments, the distribution of cells in the G1, S and G2/M phases was similar for the "No C/EBPα " and sham-transfected cells. Cells were transfected with the control expression vector (Sham), the transcriptionally active C/EBPα-GFP expression vector or the transcriptionally inactive GFP-C/EBPα expression vector and treated one day later with A, nocodazole or B, mimosine. Cells from the transfections with the C/EBP-GFP and GFP-C/EBP expression vectors were separated into cells with green fluorescence above background levels (C/EBP-GFP and GFP-C/EBP) or at background (No C/EBP). The proportion of cells in the G1, S and G2/M phases were plotted as the mean +/- standard deviation from A, six or B, three independent experiments. Statistically significant differences in the proportion of cells in G1, S or G2/M, relative to the proportions determined for the sham-transfected cells, are indicated (one-way ANOVA: **, p < 0.01; *p < 0.05; -, no difference). 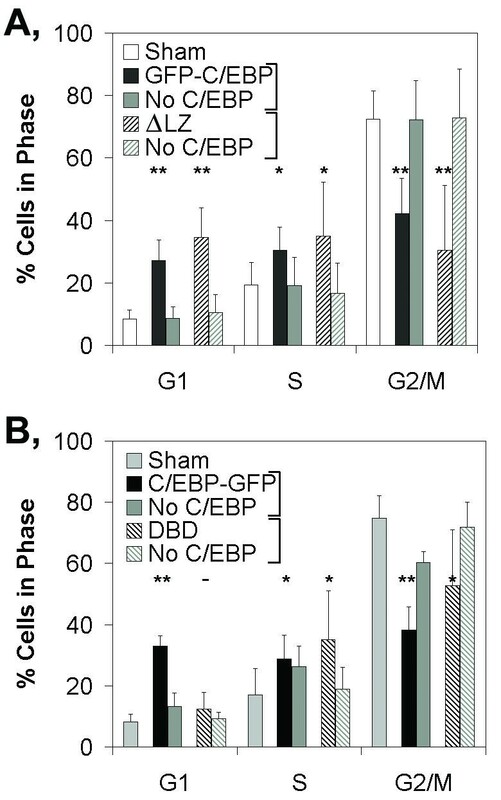 The expression of C/EBPα-GFP or GFP-C/EBPα resulted in a statistically significant decrease in the amount of cells blocked in G2/M upon nocodazole treatment compared to sham-transfected cells (Fig. 4A) (p << 0.01, n = 6). This indicated that C/EBPα expression prevented a significant proportion of GHFT1-5 cells from reaching G2/M to be blocked by nocodazole. When cells were blocked in G1 by mimosine treatment, C/EBPα expression caused no decrease in the proportion of cells in G2/M (Fig. 4B). This demonstrated that C/EBPα expression did not actively decrease the proportion of cells in G2/M. The C/EBPα-induced reduction in cells blocked in G2/M was associated with a highly statistically significant increase in the proportion of GHFT1-5 pituitary progenitor cells in G1 (p < 0.001) and a statistically significant increase in the proportion of cells in S phase (p < 0.03) (Fig. 4A). This retention of GHFT1-5 cells in the G1 and S phases of the cell cycle occurred for both the transcriptionally active C/EBPα-GFP and inactive GFP-C/EBPα fusions. The independence of C/EBPα-induced proliferation arrest from C/EBPα-regulated transcriptional activation also has been observed in other studies [25, 26]. Thus, simple transcription activation mechanisms do not account for the effect of C/EBPα on the cell cycle. Our prior fluorescence microscopy studies showed that C/EBPα-GFP, GFP-C/EBPα, and antibody-stained C/EBPα [45, 46], concentrated at specific intranuclear domains in GHFT1-5 cells (see Fig. 5A, GFP-C/EBPα). These domains coincide with regions that stain with the blue fluorescent DNA-binding dye Hoechst 33342 (Fig. 5A, Hoechst 33342). Hoechst 33342 stains AT-rich DNA that concentrates around the centromeres [45, 49]. Given the role of the centromere as a checkpoint for regulation of the mitotic phase of the cell cycle [50, 51], it was hypothesized that C/EBPα localization around the centromere could play a role in C/EBPα regulation of the cell cycle . A, GFP-C/EBP or, B, GFP-C/EBP deleted of amino acids 310 to 358 (ΔLZ) were expressed in GHFT1-5 cells. The ΔLZ construct is depicted in figure 1B. The transfected cells were counter-stained with the blue fluorescent, DNA-binding dye Hoechst 33342 immediately before analysis by fluorescence microscopy. Green fluorescent (left panels) and blue fluorescent (right panels) images were collected from a single cell using filter sets that selectively discriminate GFP and Hoechst 33342 fluorescence (see Materials and Methods). 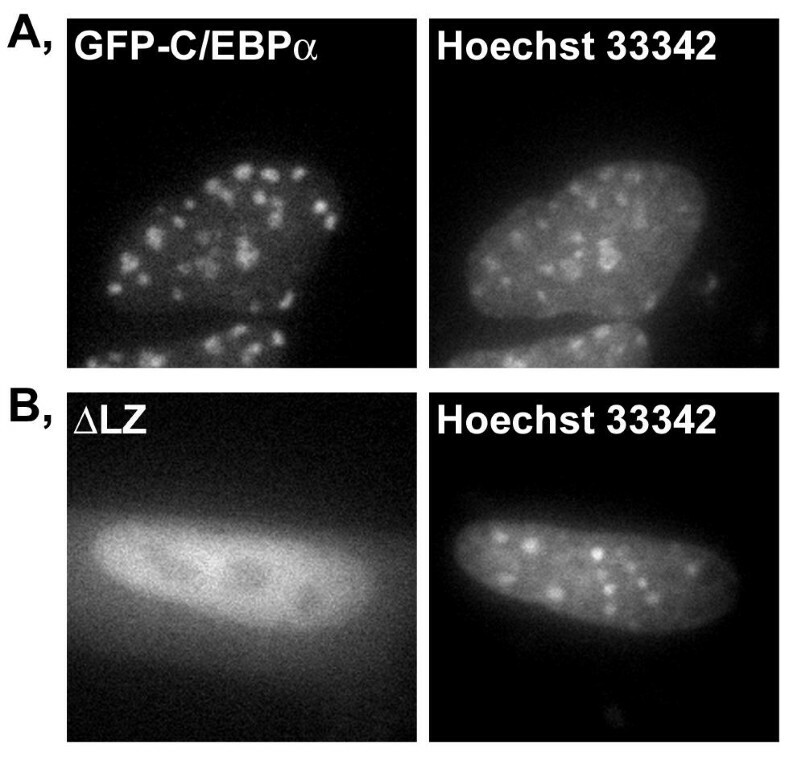 The subnuclear position of GFP-C/EBPα and ΔLZ were compared to the subnuclear position of the peri-centromeric chromatin stained by Hoechst 33342. Representative images are shown. To investigate if targeting of C/EBPα to the peri-centromeric chromatin is necessary or sufficient to cause G1 and S phase prolongation in GHFT1-5 cells, we first determined the domain of C/EBPα required to target C/EBPα to the peri-centromeric chromatin. It was previously suggested that the peri-centromeric targeting of C/EBPα was a function of DNA binding: C/EBPα binding sites are concentrated within the repeated DNA sequences that comprise the bulk of peri-centromeric chromatin . Indeed, C/EBPα truncated to contain little more than the DNA binding, bZIP domain still concentrated at peri-centromeric chromatin . By contrast, C/EBPα deleted of amino acids 310 to 358 (Fig. 1B, ΔLZ) no longer targeted to the peri-centromeric DNA (Fig. 5B). This deletion disrupts DNA binding (Fig. 2C) by eliminating the leucine zipper required for DNA binding by all members of the bZIP family of transcription factors . Thus, as predicted , the bZIP domain is necessary and sufficient for C/EBPα targeting to peri-centromeric chromatin. When expressed in GHFT1-5 cells, ΔLZ was as effective as full-length GFP-C/EBPα in prolonging both G1 and S (Fig. 6A). Thus, leucine zipper dimerization, site-specific DNA binding and targeting of C/EBPα to peri-centromeric were not required for C/EBPα prolongation in G1 and S. In contrast, the isolated C/EBPα bZIP DNA binding domain (Fig. 1B, DBD), which still targeted to peri-centromeric chromatin, did not prolong G1 (Fig. 6B). S phase remained prolonged upon DBD expression. 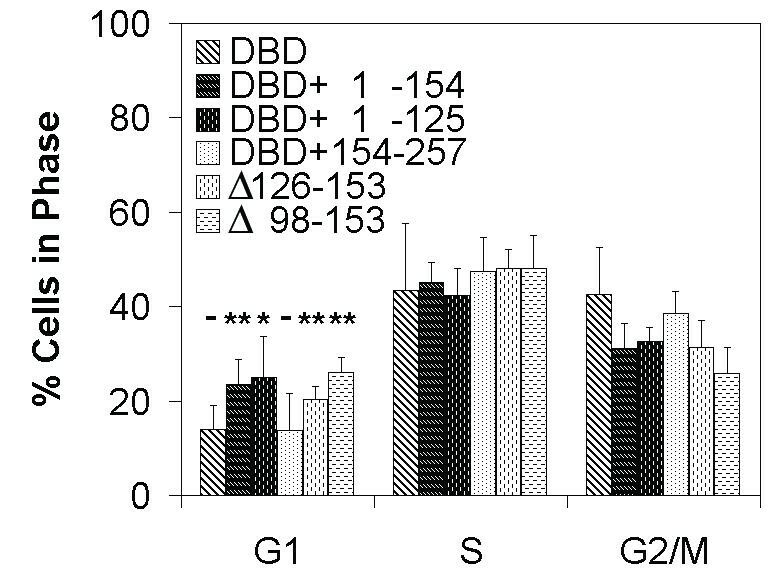 The different effects of the isolated DBD on G1 and S blockage indicated that C/EBPα regulation of G1 and S phase arrest was mechanistically distinct. Thus, C/EBPα regulates proliferation by two distinct pathways. Both pathways do not depend upon site-specific DNA binding, which is commonly considered a prerequisite for gene-specific transcription. GHFT1-5 cells were transfected with the A, Sham, GFP-C/EBP and ΔLZ expression vectors or B, Sham, C/EBP-GFP and DBD expression vectors and treated with nocodazole. The proportions of cells in G1, S and M phase were determined and plotted as the mean +/- standard deviation from six independent experiments for both A and B. No C/EBP, the subpopulation of cells with background levels of green fluorescence (i.e. did not express GFP-linked C/EBPα). Data from No C/EBP cells are shown adjacent to the green fluorescent cells for each expression construct. Statistically significant differences in the proportion of green fluorescent cells in G1, S or G2/M, relative to the proportions determined for the sham-transfected cells, are indicated (One-way ANOVA: **, p < 0.01; *p < 0.05; -, no difference). The C/EBPα DBD therefore was insufficient for prolongation of G1 (Fig. 6B). We next determined which additional domains of C/EBPα were required for G1 prolongation. C/EBPα amino acids 1–154 or 154–257 were appended to the DBD (see Fig. 1B). The addition of amino acids 1–154 (Fig. 7, DBD + 1–154) caused a statistically significant increase, relative to sham-transfected cells, in the proportion of cells in G1 (p << 0.01, n = 6). The proportion of cells in G1 was not statistically different in cells expressing DBD + 1–154 from that in cells expressing full-length C/EBPα-GFP. Adding amino acids 1–125, instead of amino acids 1–154, caused a similar prolongation in G1 (Fig. 7, DBD + 1–125). Thus, an element in the amino terminal domain of C/EBPα was required for G1 prolongation. The indicated amino acids of C/EBPα were appended to DBD-GFP (see Fig. 1B) and expressed in GHFT1-5 cells. The proportions of green fluorescent cells in G1, S and M phase in nocodazole-treated cells were determined and plotted as the mean +/- standard deviation from three independent experiments. The DBD + 1–154 mutant was repeated a total six times (not shown), for which the statistical significance remained p < 0.01. Statistically significant increases in the proportion of G1 cells, compared to Sham cells, are indicated (One-way ANOVA: **, p < 0.01; *p < 0.05; -, no difference). In contrast, addition of amino acids 154–257 to C/EBPα DBD did not rescue G1 prolongation (Fig. 7, DBD + 154–257). Again, appending amino acids 1–125 to this mutant restored G1 prolongation (A126–153), as did amino acids 1–97 (A 98–153). All of the mutants contained the DBD and prolonged the cell cycle in S phase (Fig. 7). Thus, the DNA binding, bZIP domain was sufficient to direct S phase regulation by C/EBPα whereas amino acids 1–97 contained a domain required for G1 regulation. The differentiative and anti-mitotic actions of C/EBPα have been observed in a variety of cell culture models [23, 24, 26, 40, 53]. To date, studies of the C/EBPα block of proliferation have relied on comparing the growth [23–25, 40] or DNA synthetic [22, 24–27] rates of C/EBPα-expressing and non-expressing cells. These studies suggest that multiple, possibly independent, mechanisms may contribute to C/EBPα arrest in a variety of cells [18, 23–26, 33–37, 40, 54–56]. Studies that distinguish the anti-proliferative actions of C/EBPα at different phases of the cell cycle, and in specific cell types, may clarify these discrepancies. Our studies showed that C/EBPα expression prolonged the proliferation of GHFT1-5 pituitary progenitor cells at two different phases of the cell cycle, G1 and S (Fig. 4). A G1 block has been reported previously in C/EBPα-expressing mouse L cells . However, those studies did not define the activities within C/EBPα required for that blockage. Here, we observed that prolongation in G1 required the amino terminal 97 amino acids of C/EBPα (Fig. 7.). In contrast, amino acids 1 to 97 were not required for S phase arrest (Figs. 6, 7). This showed that C/EBPα prolongation of GHFT1-5 cells in the G1 and S phases occurred through molecularly distinct pathways. Such distinct effects on G1 and S may contribute to the wide variations in mechanisms reported, to date, to participate in proliferation arrest by C/EBPα. Candidate mechanisms for the block of proliferation by C/EBPα include 1) activation of the gene promoters of the cyclin-dependent kinase inhibitor p21 , gadd45 [5, 6], gas2 and gas3 [38, 39], 2) post-transcriptional stabilization of p21 , or 3) interactions of C/EBPα with cell cycle proteins including p21 [22, 24, 25, 55], CDK2 [25, 36], CDK4 , retinoblastoma , the retinoblastoma-related protein p107  and the G1/S-regulating E2F transcription complex [26, 33] (Fig. 1A). We found that transcriptional activation domain 3 and the leucine zipper were not required for prolongation of either G1 or S (Fig 7). These domains interact with p21, CDK2 and CDK4 [22, 24, 25, 36, 55]. Thus, C/EBPα interactions with at least p21 and CDK4 were not required for the anti-proliferative actions of C/EBPα in GHFT1-5 cells. CDK2, and other proteins, also interact with another domain of C/EBPα  required for proliferation arrest (discussed below). Arrest in S phase was associated with amino acids 259 to 310 (Fig. 6), which include the basic amino acid-rich, DNA binding region of C/EBPα. C/EBPα deleted of the leucine zipper dimerization domain, also required for DNA binding  (Fig. 2C), was as effective as full-length GFP-C/EBPα in prolonging both S and G1 (Fig. 6A). Thus, DNA binding per se was not required for proliferation arrest. The basic region of C/EBPα blocks the transcriptional activity of E2F by unknown mechanisms  and contains another known CDK2-interaction site . Either of these activities may contribute to basic region-dependent, S phase arrest of GHFT1-5 cell proliferation. G1 block in GHFT1-5 cells required C/EBPα amino acids 1–97 (Fig. 7), comprising activation domains 1 and 2 . Amino acids 1 to 97 have been implicated in C/EBPα growth arrest via the E2F/pl07 complexes [34, 35]. C/EBPα interaction with p107 is believed to prevent the formation of an S-phase promoting complex containing p107 and E2F [26, 34, 35]. Thus, G1 block in GHFT1-5 cells may be related to the ability of C/EBPα to interact with p107. However, the amino terminus of C/EBPα also functionally interacts with a number of other factors [31, 45, 46], any of which might contribute to proliferation arrest. Tang and Lane  showed that C/EBPα becomes associated with peri-centromeric chromatin upon expression during adipocyte differentiation. We observed that C/EBPα, expressed in mouse pituitary progenitor GHFT1-5 cells, also localized to peri-centromeric chromatin . Here we show that targeting of C/EBPα to peri-centromeric chromatin in GHFT1-5 cells required the DNA binding domain of C/EBPα (Fig. 5). However, C/EBPα deleted of the DNA binding domain was as effective as full-length C/EBPα in prolonging GHFT1-5 cells in the G1 and S phases of the cell cycle (Fig. 6A). Thus, the specific association of C/EBPα with peri-centromeric chromatin, speculated to contribute to C/EBPα growth arrest , was not necessary for disruption of the cell cycle by C/EBPα. The independence of C/EBPα regulation of proliferation from its intranuclear localization may even be necessary since we have recently determined that pituitary cell differentiation is associated with the dispersal of C/EBPα from peri-centromeric heterochromatin by the pituitary-specific transcription factor Pit-1 (J. F. E., M. A. Kawecki, F. S., R. N. D., submitted). Transcription factors, like C/EBPα, may regulate cell proliferation by directly controlling the expression of proteins required for cell cycle progression. Indeed, C/EBPα activates transcription of the p21 , gadd45 [5, 6], gas2 and gas3 [38, 39] genes. However, similar levels of p21 mRNA in the livers of wild-type and homozygous C/EBPα knock-out mice  argue against a physiologically significant contribution of C/EBPα to p21 gene transcription in the liver. We also observed that transcriptionally inactive and DNA-binding-defective forms of C/EBPα still blocked GHFT1-5 cell proliferation in both the G1 and S phases of the cell cycle (Figs. 2, 4,6). DNA-binding-defective mutants of C/EBPα have also been observed to block proliferation in other cell lines [25, 33]. Together, this suggests that C/EBPα regulation of transcription, in general, might not contribute to the regulation of cell proliferation. It remains possible that C/EBPα activation of the transcription of some cell cycle regulatory genes does control proliferation in some cell types or under certain conditions [8, 37–39, 56]. The absence of a dependence of GHFT1-5 cell proliferation on transcription factor activities that are more classically associated with transcription regulation strongly suggests that C/EBPα, and perhaps other transcription factors, control proliferation and transcription through completely separable pathways. The effects of human papilloma virus E7 proteins on C/EBPα-induced differentiation and growth arrest also suggest that the effects of C/EBPα on proliferation are mechanistically divergent . Having distinct mechanisms for regulation of gene transcription and proliferation allows a transcription factor to regulate these two critical processes completely independently of one another. This may be particularly important in differentiated, non-proliferating cells in which events that regulate a transcription factor's contribution to gene expression must be disconnected from that transcription factor's continuing blockage of proliferation. C/EBPα is a transcription factor that controls both proliferation and gene expression. C/EBPα uses molecularly distinct mechanisms to prolong the G1 and S phases of pituitary progenitor GHFT1-5 cells. The anti-proliferative effects of C/EBPα do not require activities in C/EBPα commonly required for gene-specific transcription. Proliferation arrest instead corresponds with C/EBPα domains previously implicated in post-transcriptional effects on E2F and/or CDK2 activity. The GFP-C/EBPα vector was constructed by inserting the cDNA encoding the S65T derivative of GFP  at the start codon of the cDNA encoding rat C/EBPα. The fused cDNA was cloned into a previously described expression vector . The GFP and C/EBPα portions of the fusion were separated by a 16 amino acid long linker including the epitope for the FLAG antibody. The C/EBPα-GFP vector was constructed by inserting the S65T GFP into the NcoI site present near the carboxy terminus of rat C/EBPα (also tagged at the amino terminus with the FLAG epitope) in our previously described C/EBPα expression vector . This resulted in a deletion of the last four amino acids of C/EBPα. The DBD and DBD + 154–257 derivatives of C/EBPα were constructed by replacing, respectively, the amino terminal 257 amino acids of C/EBPα-GFP (to the SgrAI site of C/EBPα) and the amino terminal 153 amino acids of C/EBPα-GFP (to the NotI site of C/EBPα) with oligonucleotides containing a strong Kozak sequence. DBD + 1–154 was constructed by replacing amino acids 155 to 257 (from the NotI to SgrAI sites) with an oligonucleotide. The remaining constructs (Fig. 7) were generated by appending C/EBPα fragments to the NotI site of DBD + 1–154, or to the SgrAI site of DBD. ΔLZ was constructed by deleting amino acids from amino acid 310 (Tth111II site) at the junction of the basic region and leucine zipper of C/EBPα to the carboxy terminus of the GFP-C/EBPα fusion. The C/EBP-TATA reporter used to determine the transcriptional activity of the two GFP fusion proteins was previously described . GHFT1-5 cells were propagated at 37°C and 5% CO2 in Dulbecco's modified Eagle (DME-H21) medium supplemented with 10% fetal calf serum. Approximately 1 × 107 cells were transfected by electroporation, as previously described , with 5 μg of either the C/EBPα-GFP, GFP-C/EBPα, or control expression vectors. Following transfection, cells were propagated at 33°C. Incubation at 33°C results in significantly higher levels of green fluorescence (unpublished data), presumably because of better folding of the jellyfish GFP. Transfected cells were maintained in the dark throughout the experiment to minimize fluorescence activation of GFP prior to flow cytometry. Electrophoretic mobility shifts assays were done by mixing a radiolabeled oligonucleotide containing a consensus, high affinity C/EBP binding site (GATCGAGCCCCATTGCGCAATCATAGATC) together with extracts prepared from transfected cells as previously described [58, 59]. Competition with the same, unlabeled oligonucleotide in 1, 10 or 100 molar excess of the radiolabeled probed indicated specific binding. The protein DNA complex was supershifted with an antibody directed against C/EBPα (Santa Cruz Biotechnology, sc-61). For studies of the transcriptional activation properties of the fusion proteins, 1 μg of the C/EBP-TATA vector  was co-transfected and transcriptional activity was assessed by measuring the amount of chloramphenicol acetyltransferase reporter expressed with and without C/EBPα expression . Following transfection, most cells were plated into 14 cm dishes and allowed to grow for 24 hours. This ensured that the cells were not confluent by the time of collection for cell cycle analysis. A small portion of the transfected cells were cultivated on a 22 × 22 mm No. 1 borosilicate glass cover slip in a separate 6-well dish and treated with nocodazole, mimosine or vehicle alone as described below. The coverslips were removed for fluorescence microscopic observation immediately before collecting cells for flow cytometric analysis of DNA content and GFP expression. Cells were stained 10–20 minutes with 5 μg/ml of the cell-permeable DNA binding dye Hoechst 33342. The green fluorescence emitted from C/EBPα tagged with GFP and the blue fluorescence emitted from Hoechst 33342-stained DNA were readily distinguished by selectively exciting each fluorophore and capturing fluorescence emissions specific for each fluorophore using appropriate excitation and emission filter sets (Chroma Technology Corporation, Brattelboro, VT). The images shown in Fig. 5 were acquired using an Olympus 40X PlanApochromat (0.95 numerical aperture) objective on an Olympus IX-70 microscope. Metamorph acquisition software (Universal Imaging Corporation, Downingtown, PA) on an Orca cooled interline camera (Hamamatsu, Bridgewater, NJ) were used to collect the images. The C/EBPα fusion proteins were expressed for one day following transfection, after which we added to the cell culture media 100 ng/ml nocodazole (Sigma) in dimethylsulphoxide (DMSO), 0.5 mM mimosine (Sigma) in DMSO, or DMSO vehicle. In some experiments, cells were also grown for 48 and 72 hours post-transfection before applying nocodazole (data not shown). The distributions of cells in G1, S and G2/M, in the presence or absence of C/EBPα expression, were similar for cells grown for 24 (reported here), 48 or 72 hours (data not shown) prior to nocodazole addition. Following nocodazole, mimosine or DMSO addition, the transfected GHFT1-5 cells continued to be cultivated at 33°C. 24 hours after drug or vehicle treatment, transfected cells were trypsinized, collected in DME-H21 media containing 10% fetal calf serum, and washed twice with PBS. The harvested cells (typically 5 × 106 to 1 × 107 cells) were resuspended in 300 μl of 8 μg/ml propidium iodide (Molecular Probes) in PBS containing 0.1% NP-40 and 10 μg/ml RNAse A, then incubated at room temperature in the dark for 30 minutes. The cell suspension was then analyzed on a FACScan flow cytometer (Becton Dickinson) at a flow rate of 12 μl/min. Fluorescence of the GFP and propidium iodide-bound DNA was excited with a 488 nm argon-ion laser. Green GFP fluorescence was collected using a 530/30-nm band pass filter, and orange emission from propidium iodide-bound DNA was detected using a 585/42-nm band pass filter. Photomultiplier tube voltage and spectral compensation were initially set using single-stained cells (cells expressing GFP fusions with C/EBPα but not stained with propidium iodide and cells transfected with the control vector containing no GFP cDNA but stained with propidium iodide). Electronic compensation was adjusted among the fluorescence channels to remove residual spectral overlap. The area and width of each event were measured to discriminate intact single cells from debris and from doublet or multiple cells stuck together. GFP fluorescence and propidium iodide-stained DNA fluorescence was thus collected from single cells. A minimum of 10,000 cellular events was collected for each sample. Data was analyzed using CELLQuest software (Becton Dickenson), and cell cycle subset analyses of DNA histograms were performed using ModFitLT™ software (Verity Software House, Topsham, ME). One-way analysis of variance was used to compare data from multiple independent experiments. Statistically significant differences (**, p < 0.01; *, p < 0.05 compared to the Sham-transfected cells) and experiment number are indicated in the figures and legends. All significant differences were confirmed by paired, one-tailed t-tests. We thank Dr. Paul Webb (U.C.S.F.) for critical reading of the manuscript. This work was supported by Public Health Service grant DK-54345 from the National Institutes of Health.